The Lion King 3D‘s successful release, and the subsequent Disney announcement that more converted classics are coming, has pretty definitively proven that the post-converting industry will stay hopping long after new 3D movies have all moved to shooting natively in the format. And while in America we already have a packed pipeline of converted 3D films, over in South Korea they are just completing their first-ever post-conversion. 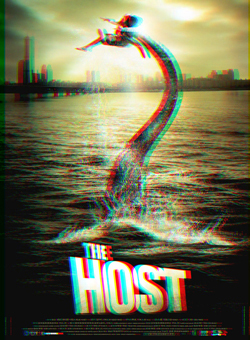 The 2D-to-3D process has been in fact been applied to a film you probably recognize: The Host. The 2006 monster movie was very well regarded by genre fans in the states, as its mix of well-shot monster action and entertaining family drama hit all the right notes. But while we certainly liked it here, the film is beloved in its home country and became the highest-grossing film in the country’s history. There’s no suggestion that the conversion will make it to the states, but I would imagine it would make it to some theaters at some point or another. Whether that’s purely an LA special screening type thing or if it gets some kind of minor stateside rerelease along with its Korean bow is up to guess at this point. The article also throws out a mention that Joon-ho is currently working on his first english-language film, based on french graphic novel Le Transperceneige, which he’s been attached to since he made The Host. There’s also an expected sequel to The Host said to be coming to Korea in 2013, but that’s not Joon-ho’s film. I’d imagine we’ll hear more about both of them in 2012.